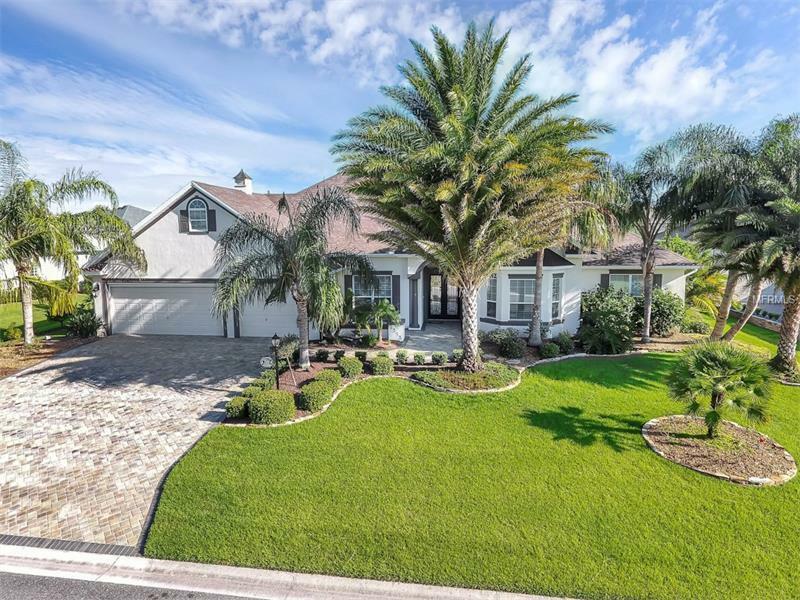 This exquisite home where no detail has been overlooked a Premier "Sanibel Model" located in the sort after community of Bridgeport at Miona Shores. All of the bells and whistles have been added , Gourmet Kitchen with stainless steel 6 burner gas stove top, professional exhaust hood, double ovens one being convection, two wine coolers two pantry's all in a new custom alabaster raised panel cabinetry and has spectacular granite counters and back splash with accent lighting thru out and a solar tube. Beautiful custom double entry doors brings you into a stylish formal living room with 8 inch crown molding and full tray ceiling molding with lighting, with a clear view to the family room and French doors to the patio/pool area. The entire home has 8 inch crown molding and all tray ceilings have received the full treatment and lighting complimenting the large format neutral ceramic flooring. All of the baths have also been updated with granite and cabinetry and fixtures and lighting. The Master bedroom suite includes granite counter tops, a spa tub, walk in shower , custom closet and French doors to the patio. Exterior elements of this home were not overlooked, pavers on the drive, paint and luscious landscaping with assorted fruit trees and a new roof installed in 2015. Architectural pool surround is the final touch to the secluded pool/patio area with outdoor kitchen, storage closet for pool toys and finished with matching pavers. Come see this slice of paradise you won't be disappointed.